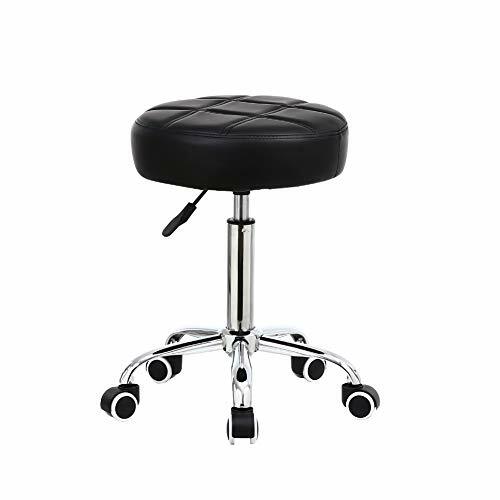 This stool is ideal for salons, barbers, tattoo shops, beauticians and doctor offices. This classic design is comfortable with soft, strong black PU leather with thick padding, and a five-star base with extra smooth wheels for stability. Product Dimensions:19.68" x 19.68 "x 18.89"-23.62"
Adjustable Height: Hydraulic gas lift makes height adjustment as simple as the pull of a lever,Adjustable height of 18" to 23". Warm note : Pls remove the black plastic on the top of gas lift before assembling. 360 Swivel Seat: Pivoting seat swivels 360 degrees giving you the ability to switch directions, back and forth as needed, with ease. ,generous 3.5 density permanently mouded seat pad offers you comfort. Updated Base: Base has been upgraded to Nylon,which is flexible and absorbs pressure far better than the previous plastic material.It is now stronger and more durable. Modern design that fits perfectly in every home or commercial use. It is ideal for salons, barbers, tattoo shops, beauticians ,doctor offices and home use! This stool is lightweight and practical and easy to assemble! Weight 8 lbs,capacity :250 lbs. Cushion Material: Made of PU leather and filled with high-density, high-quality sponges. Height Adjustment: Height adjustment is made easy with the gas hydraulic system. Simply pull the lever up to adjust the height to your desired level. It is ideal for barber, salons, lab, warehouses, art studio, garages, tattoo shops, beauticians, doctor offices and home use. 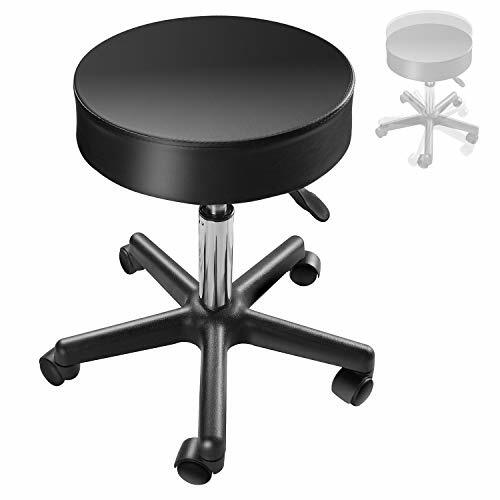 SMALL AND CONVENIENT DESIGN --Measures 16.5 by 16.5 by 18.1 to 24 inches (LxWxH); Diameter of seat pad:12.6", Seat pad thickness: 2 inches, Compact design makes this stool ideal for use in small spaces where extra seating is needed. 360-DEGREE SWIVEL --360-degree pivoting castor wheels roll smoothly on all surface types without causing damage. SEAT HEIGHT ADJUSTMENT -- Adjustable seat height from 18.1 to 24 inches as Hydraulic gas lift makes height adjustment as simple as the pull of a lever. FOOT REST --Comfortable foot rest makes getting on the chair easier, and provides a place to rest your feet when the chair is adjusted to a high level. MULTIFUNCTION -- It is ideal for barber, salons, lab, warehouses, art studio, garages, tattoo shops, beauticians ,doctor offices and home use. 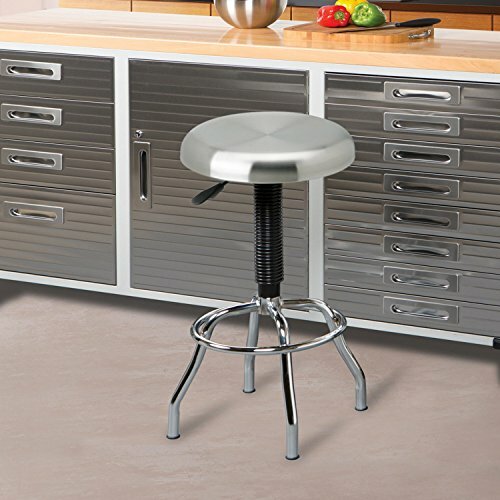 Add a modern yet contemporary touch to any room with this sleek Seville Classics Stainless Steel Top Work Stool constructed from industrial-strength chrome plated steel and accented by a sturdy easy to clean brush stainless steel (#443) seat top. 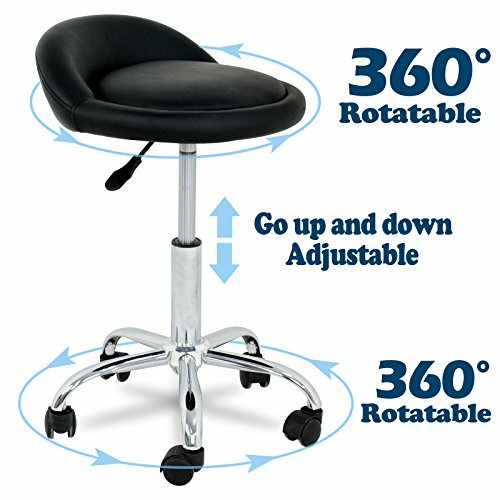 The pneumatic action 14 diameter stainless steel seat swivels 360 degrees and adjusts from a height of 25.5 to 29.75 . 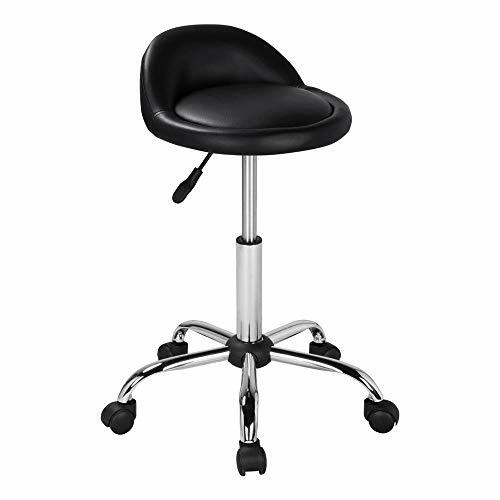 NSF certified for commercial use, this durable work stool is equipped with heavy-duty 1-inch in diameter chrome plated steel legs (19 diameter base). Easy assembly with no tools required. Ideal for use in kitchens, restaurants, offices, laboratories, warehouses, mail rooms, work centers, and man caves. Don't wait until your back hurts from holding bent over positions, save yourself from the discomfort with Super Deal. 2.85" thick and 15.35" diameter cushion provides firm support that softens and contours to your body over time, ensuring a comfortable cushion for a long period of time. Easily alter seats height with the pull of a lever. Hydraulic gas lift provides a smooth height shift that won't abruptly drop or rise. Height is adjustable from 18" to 24.5". Greater movement and support, the dual wheel castors provide a smooth glide on most surface types. Made of high quality materials to ensure surfaces are protected. Compact design makes this stool ideal for use in small spaces where extra seating is needed. Can be easily taken apart for travel or for moving purposes, then easily put back together. The comfortable seat allows people to sit for a long time comfortably without them having to move around. Measures 15" wide by 17.5" deep. Backrest rises 3.5" above the seat. Base measures 18" in diameter. Seat Height adjusts from 18" to 24.5". 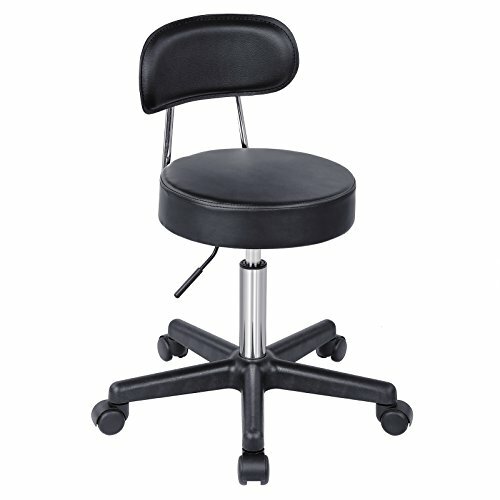 overall stool Height adjusts from 21" to 27"
With a fully adjustable height, this chair can fit you no matter how tall. The chairs are faux leather padded measuring up to 27" for a sleek appearance while still providing ultra-soft comfort. Adjust the seat to your preference as it can move from approximately18" to 24.5". Compare to backless stools on the market, it features a soft padded back for your rest. It is a nice touch as you relieve your back from stress. Add a touch of style with this chair and let go of your worries in comfort. Rolling base has been upgraded and is now stronger and more durable than our previous model, but still remains lightweight, and is more dense and weighs slightly more than the previous model, adding more support and strength. Pivoting seat swivels 360 degrees giving you the ability to switch directions, back and forth as needed, with ease. Ideal for professions or hobbies that require repeated swift movements or changes in orientation. 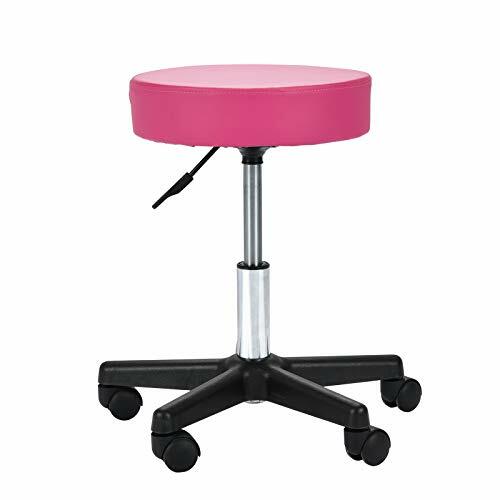 Compact design makes this stool ideal for use in small spaces where extra seating is needed, such as hair and beauty salons, tattoo studios medical place or anywhere else a chair like this may come in handy. The chair is easily assembled and comes with everything needed to put it together. 360 Swivel SEAT and HEIGHT ADJUSTMENT -- Hydraulic gas lift makes height adjustment as simple as the pull of a lever, adjustable seat height from 20 to 26 inches. This bamboo stool looks like a decorative piece, adds natural color to any color theme or home decoration. The compact and folding design makes it easier to shave in your stand shower and it is easy to move around. 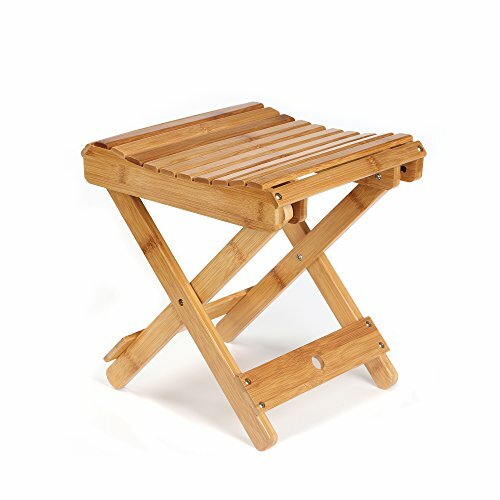 Moreover, the bamboo structure is sturdy enough to be a fully functional seat for toddlers. Why do we choose #BAMBOO FURNITURES#? *Natural and unique texture makes it a decorative piece Why do we choose #ETECHMART BAMBOO STOOL#? 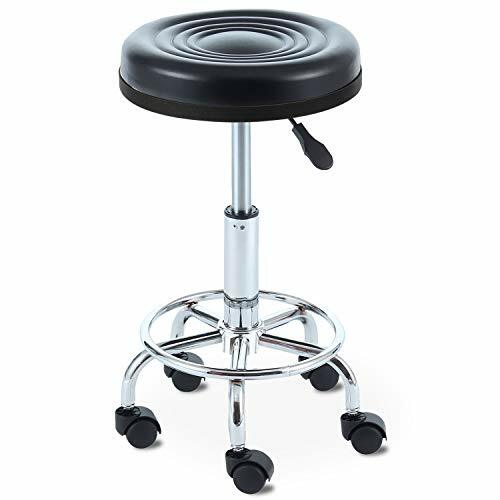 EACHPOLE 360 Degree Pivoting Height Adjustable Stool provides comfort and support in a compact stool that is ideal for use in tattoo shops, salons, massage parlors, doctors' offices, garages, schools, and more! 3.25 inch firm seat cushion gradually softens and contours to your frame over time, providing ultimate support. Castor wheels easily and smoothly roll on most surface types. Seat pivots 360 degrees making it ideal for use in applications that require regular and swift changes in orientation. Height adjustable from 18 - 23.5 inches. Features - Compact design doesn't take up much space. - Hydraulic gas lift makes adjusting the height quiet and easy by simply pulling a lever. - Smooth rolling castor wheels make moving while sitting easy. - Pivoting seat makes allows you to quickly and easily change your direction. - Seat cushion gradually softens and contours over time. - Height adjustable from 18 - 23.5 inches. - Seat cushion measures 3.25 inches. For any possible defective product, please contact us first. We will do our best to make it right with either a replacement or refund. Height adjustable from 18 - 23.5 inches via a hydraulic gas lift that is quiet. 3.25 inch firm seat cushion that gradually softens and contours to your body over time. Smooth rolling castor wheels glide with ease, protecting your surfaces from damage. Large, 360 degree pivoting seat features a 14 inch diameter seat surface which provides total comfort and support. 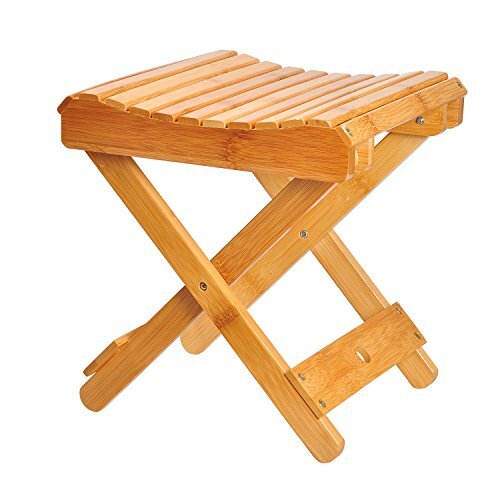 Master Massage engineers designed this stool for better comfort and design its saddle nature eases painful pressure on the back. The 2.5 exclusive Molded foam is specially molded around the seat base, rather than simply glued on. 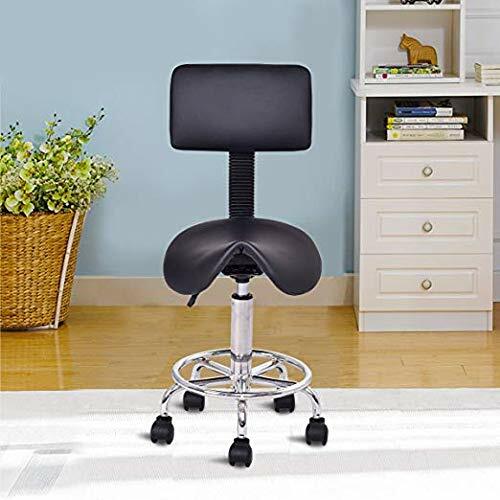 The Master Ergonomic Adjustable Saddle Stool boasts a large, comfortable 360 swivel seat, soft Rollerblade-like Polyurethane wheels (safe for hardwood floors and carpet), and hypoallergenic durable upholstery. The seat's PU upholstery is hypoallergenic, CFC-free and oil and waterproof backed by a 5 year guarantee, making it perfect for dozens of workplaces and professions. Each element of the stool has been engineered for comfort, stability and longevity. PERFECT for professionals and for at home use. Saddle seat design for more comfort and support to the spine by reducing painful pressure on the back. The hypoallergenic, CFC-free, oil and waterproof upholstery is backed by a 5 year guarantee. 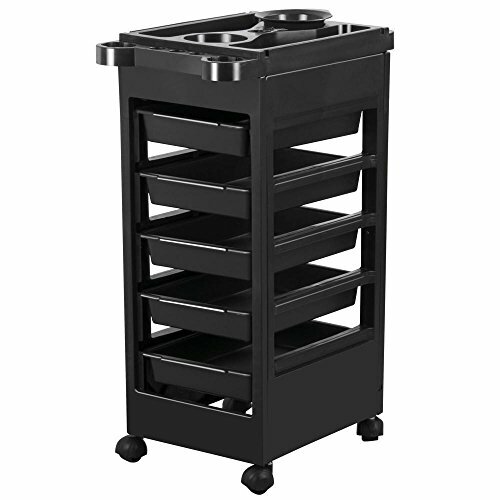 Adjustable height of 20.5 to 27.5; Weighs 11lbs but supports 550lbs. 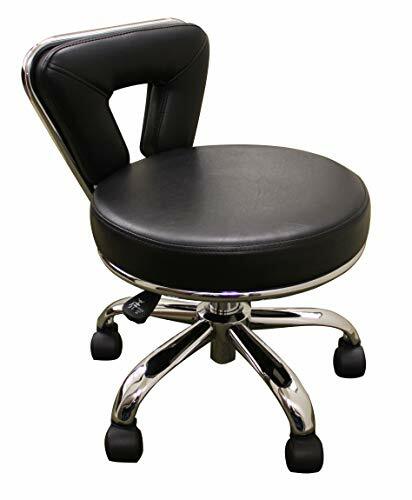 Comfortable Seat: Super thick and high density sponge (3.9''), not produce distortion, with wear-resistant PU leather, better resilience, 360 degree swivel, very comfortable. Height Adjustable: Hydraulic height adjusting rod, height adjusted from 18''-22''. Explosion-proof safety air pump, after testing procedures, can be safely used. Antiskid Mute WheelS: Five-claw chassis is stable and durable. Smooth rolling castor wheels glide with ease, protecting your surfaces from damage. This is our Comfortable PU leather cushion seat stools with adjustable height on casters for easy mobility. It features Steel frame, strong caster, PU padded seat cushion, that all makes it stable, sturdy and comfortable. The Seat height is adjustable and It Is Ideal For Used In Hairdressers, Beauticians, Barbers, Dentists, Tattoo Makers. Don't hesitate to own it! Multi-Purpose Use Comfortable cushions and adjustable height with the modern design is perfect for bar counter, kitchen, dining room, and more. Easy Movement 5 universal steering casters provide flexible mobility to go here and there smoothly. Height Adjustable The side pneumatic handle adjusts the height from 18.1'' to 23.6 easily and safely. Comfortable Design The ergonomically designed seat makes you feel more comfortable. And the chrome frame strengthens the durability and stability of this stool. 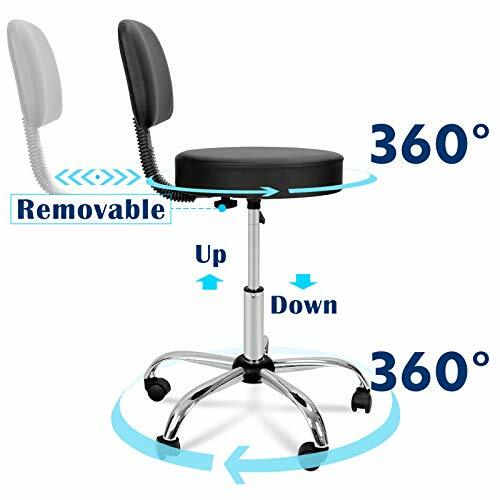 360 Degrees Swivel 360 degrees swivel design gives you or your guest the freedom of movement and the convenience to communicate with others in any direction. - Do not stand on the seat to prevent from falling off. - Do not lean backward excessively. - Do not slide or swivel rapidly; use normally. - Maintenance by wiping with clean water; do not use chemical reagents to clean the PU surface. ERGONOMIC BACKREST: Arc and paragliding backrest, based on the curvature of the waist, perfectly supports your back and helps relax the spine; helps you achieve optimal sitting position and relieve fatigue brought on by sedentary work, whether at home or at work, such as in clinic, hair salon, etc. 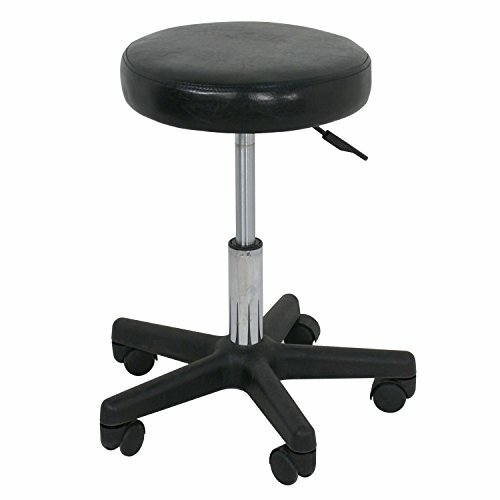 Comfortable padded pedicure stool with heavy duty five casters cast aluminum base, padded backrest, and airlift height adjustment. 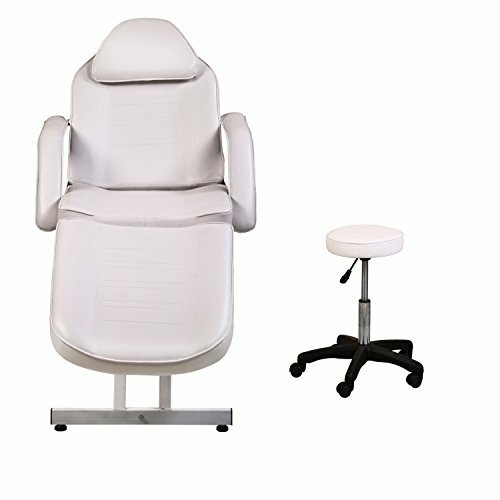 Comfortable padded pedicure stool with backrest. Heavy duty five caster base. Shorter airlift pump, perfect height for pedicure technicians. lift. 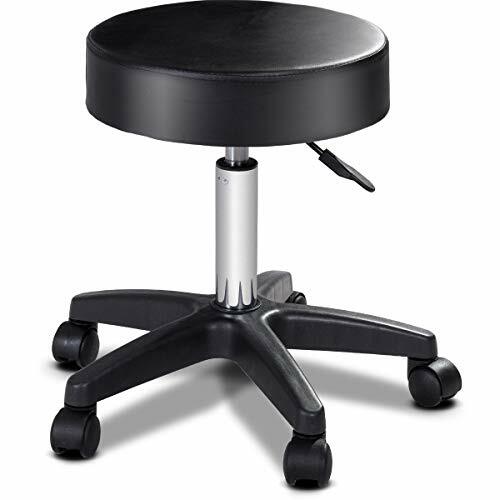 The anti-rust iron base with foot rest provides extra comfort. Excellent design that fits perfectly in every home or commercial use. It is ideal for salons, barbers, tattoo shops, beauticians ,doctor offices and home use! This stool is lightweight and practical and easy to assemble! Brand: AHP Inc. | Manufacturer: AHP Inc.
360 Swivel Seat: Pivoting seat swivels 360 degrees giving you the ability to switch directions, back and forth as needed, with ease. Generous 15.74Dia permanently mouded seat pad offers you comfort. Rolling Wheels: Five-Point dual swivel caster provides easy movement and extra stability, wheels roll smoothly on all surface types without causing damage. Comfort Back: Soft padded back support for your rest. It is a nice touch as you relieve your back from stress.Perfect for reiki and other massage, also suitable for hair salons, beauty parlors, tattoo studios and many more.